1. Mix together the five spice, soy sauce and honey and stir in the chicken. Marinate for 10-15 minutes. 2. 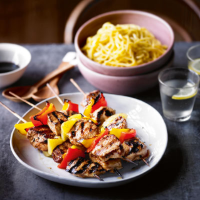 Thread the chicken onto 4 skewers, alternating with pepper and pineapple, drizzle with the marinade and turn to coat the chicken all over. 3. Place under a preheated grill for 15 minutes, turning occasionally, basting with any cooking juices, until the chicken is cooked through with no pink meat. Serve with noodles.